I love words. I even named ‘words’ as one of my favourite things in my blog intro. I have been a bookworm since I sat on a potty. Or so my mum told me. I’ve always loved to read, English and Journalism were my favoured school subjects, then I studied Communication and Linguistics at university. 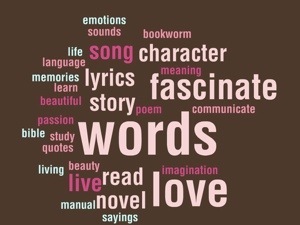 I really do love words! Now I’m not just talking about fancy, pretty or tricky sounding words. There’s a lot to be said for plain language in effective communication after all. While we’re on topic though, say these two words out loud. Protégé. Onomatopoeia. Don’t they just sound cool?! Ok, enough of that,where was I? The everyday words I come across are just as likely to reach out and grab me. Novels can take me to a whole new world. Song lyrics remind me of memories from days long past, or evoke forgotten/hidden emotions in an instant. The Bible has 66 books, broken into 1189 chapters which is just over 750,000 words – now THAT’S a comprehensive manual to live by! A well written, well delivered speech can move me (or even a nation) to action. Hashtags are powerful social media tools, just take a look at #bringbackourgirls. A thoughtful card from a friend can feel like a hug from a distance.